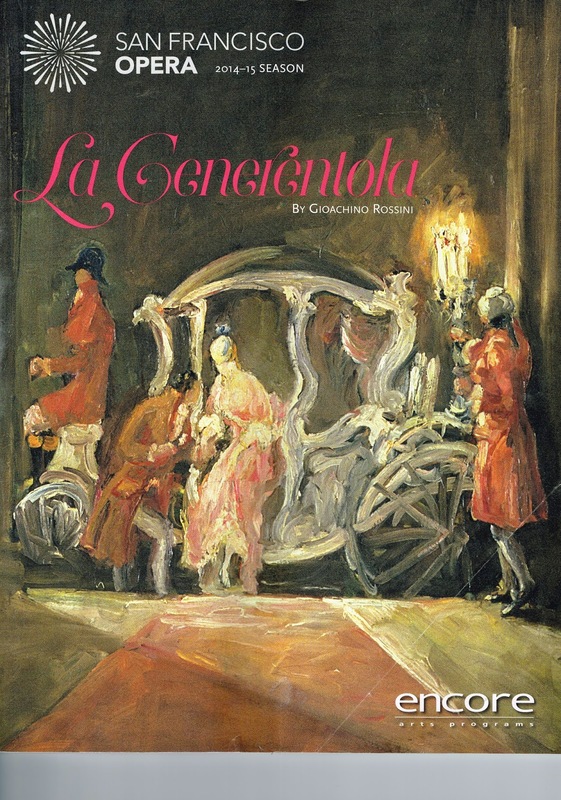 Rossini's Cenerentola takes Cinderella on a slightly different track. Forced to live and work among the cinders by her greedy stepfather and ugly sisters, the ash girl triumphs by virtue of her generous nature. She offers a small meal to a blind beggar who comes to the door of family's villa, and he in turn promises her hope that her life may change. The ugly sisters, who we meet in the opening moments as they perform their morning ablutions and beauty exercises, drive the beggar away. Later the prince will invite all to a ball. In a twist on the plot, the prince decides he will change places with his man servant so that he may see all of the ladies in their true colors. Highlights of San Francisco Opera's performance included the prince's retinue of 20 valets, who appear in red coats with red roses as they parade in. Later we will see them in frock coats and top hats, and finally, in morning coats and white gloves. Each waves a large white hankie and snuffles loudly with joy when the happy couple wed.